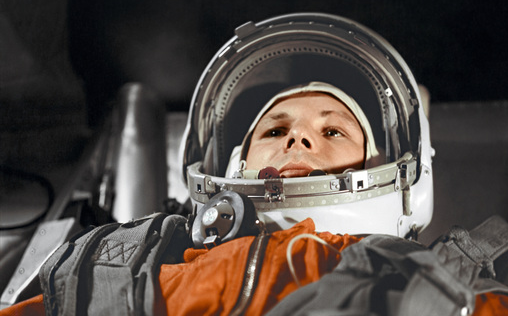 Cosmonaut Yuri Gagarin in the Vostok spacecraft, 12 April 1961. Credits: RIA Novosti. From 5 April to 28 August 2011, the Palais de la Découverte in Paris is celebrating the 50th anniversary of the first human spaceflight with an exhibition on the theme “Yuri Gagarin: a revolution”. CNES is among the partners supporting this exhibition co-organized by Universcience and Russian news agency RIA Novosti. The exhibition will be showing archives pictures—some of them for the first time—of the Russian cosmonaut, his flight and other milestone events in the space adventure. In all, 33 photographs, artwork pictures and videos, including a new film, will be on display for the visiting public. 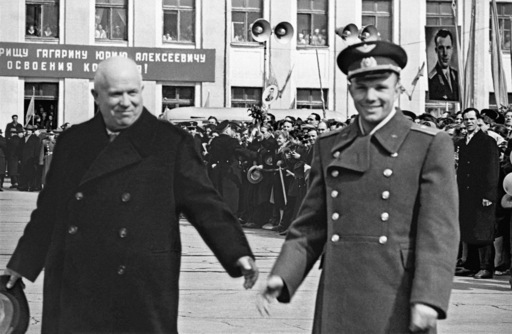 Yuri Gagarin and Nikita Khrushchev at Moscow’s Vnukovo airport just after the cosmonaut’s historic flight in 1961. Credits: RIA Novosti/Aleksandr Sergeev. Yuri Gagarin came from a modest background and originally worked as an apprentice foundryman before pursuing his studies in this field at technical school. But he was also an aviation enthusiast and a keen amateur pilot, going on to become a fighter pilot in the Soviet Air Force after graduating from air cadet school. He was chosen for the nascent Soviet space programme and selected in the first group of cosmonauts. Chosen to become the first human to fly in space, Gagarin lifted off from Baikonur in the former Soviet Union in the Vostok-1 capsule on 12 April 1961. The spacecraft orbited Earth for 108 minutes at an average altitude of 250 km. After ejecting from the craft and a bumpy parachute descent, Yuri Gagarin landed safely near the town of Saratov. At the age of 27, he thus became the first human to travel in space and the pioneer of an extraordinary adventure, marking the beginning of the space era. Today, continuously closer cooperation between nations is taking humans ever further into unexplored distant territories. “Yuri Gagarin: a revolution”, exhibition at the Palais de la Découverte, 5 April to 28 August 2011. Open Tuesday to Saturday from 9.30 to 18.00, and Sundays and bank holidays from 10.00 to 19.00. Avenue Franklin D. Roosevelt, Paris, 8th arrondissement.